EyeSpyFX are pleased to announce the launch of MyWebcam for Windows Phone. 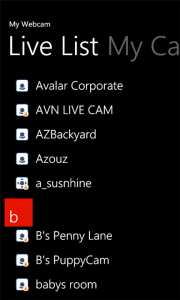 View your webcam & 100’s of webcams worldwide live on your Windows Phone. This is our first Windows Phone Application & we’re very excited about the potential new users the platform might bring. You can expect to see more of our Apps coming to the Windows Marketplace soon. Including WorldCams, AXIS Cams, D-Link Cams & others. MyWebcam is already available on Android, Blackberry, Java Mobile, iPhone & iPad. So this latest addition makes the MyWebcam service available to users on all the major mobile platforms.